April’s lovely spring weather found us dowsing for archaeology. At an earlier meeting we had learned the theory, and now we were keen to try it out in practice. It was exciting to know we could use our dowsing rods to discover different periods of occupation and that the depth at which artifacts were buried was no barrier. Armed with dowsing rods, pendulums, surveying and recording equipment, including flags for marking the layout of buildings, a compass, measuring tapes and a global positioning receiver, twelve of us descended on two fields adjacent to member Peter Gibson’s house in Shepherds Patch. The house includes parts of two cottages built in the early 1800s, although an 1803 map of the Parish shows a building existing on that site by the 1700s. This is supported by artifacts found in the garden and a disused well, dated by the Gloucester Museum some 10 years ago and ‘showing continuous domestic occupation since 1650’. We have dowsed the property and surrounding fields on several occasions, and discovered many different occupation levels from pre-history onward. In 2005 we confirmed that the original building had been a major farmhouse and the outline of the house and barn were traced. The top of the adjacent field had also been investigated, concentrating on the 16th-century occupation level, and a number of workers’ cottages and pigsties were indicated. This time we planned to home in on occupation during the 18th century. We divided into three groups, each led by an experienced dowser, and were allocated different sections of the field. The weather was perfect for field work, sun not too hot, no volcanic ash, and the ewes and lambs kept well away. Several beginners were delighted with the quick response to their newly acquired skills. Asking our rods what was there in the 18th century only, it seemed several of the 16th-century buildings still remained, including that essential of any farming community, a cider and beer house. This was genuinely essential in those days because the water from relatively shallow wells would have been undrinkable. Further dowsing indicated that the cottages had been demolished around the middle of the 18th century and a long hedge planted the length of the field. Reference to the 1803 map, at first concealed from the dowsers, showed an orchard in that field, probably apples for cider. This could indicate a change of ownership or a reduction in the demand for wool. 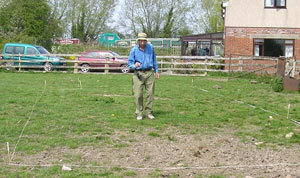 Chairman Peter Golding marked the outline of a barn, 8 metres long by 4metres wide in the field adjacent to the farmhouse. Peter Gibson discovered a dwelling attached to the end of it; dowsing suggested it had been built around 1750 and demolished at the beginning of the 1800s, about the same time the canal was being built nearby. Other buildings in this field were probably demolished around the same time. It’s an ongoing labour of love to continue dowsing these fields in our spare time, and to develop the fascinating local history to be found there.